T.S. Eliot had some ideas about April being the cruelest month. Today, the 100th anniversary of the sinking of the Titanic, political cartoonist Mark Hurwitt has a befitting image (above) depicting the current state of the Atlantic Yards mega-monopoly debacle. The deceptions, which meant that Ratner and ESDC consciously avoided considering substantial negative impacts of his mega-project to the community, were practiced by Ratner and ESDC partly so that Ratner could illegitimately meet an IRS deadline (shades of April15th!) without which the Prokhorov/Ratner basketball arena would probably never have proceeded. Ratner and ESDC were falsely asserting that Ratner would fully construct his mega-monopoly with a ten-year time frame while concealing their expectation and plans for it to take multiple decades. After hitting the iceberg the Titanic broke up. 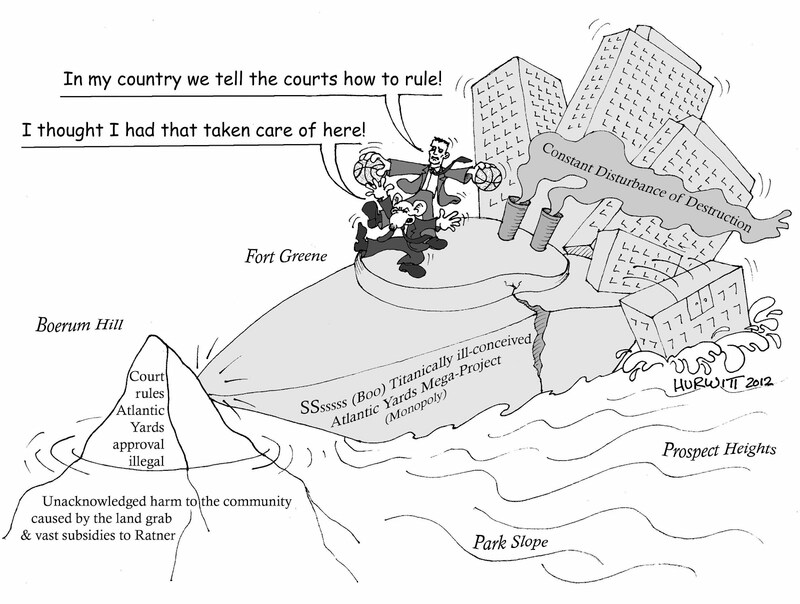 The court ruling means that the environmental impact of the Ratner’s proposed mega-monopoly must be freshly considered (as it was never actually properly considered at all) and that means that one of the prospective effects of such consideration is that what was once considered as one huge mega-project solely owned by Ratner may now be broken up into multiple parcels to be developed by multiple smaller (better) developers as, for instance, is envisioned in the community’s UNITY Plan. It’s the better way to go. Mark Hurwitt has cartooned on the Atlantic Yards theme before (see Mr. Markowitz below). I often find Mr. Hurwitt’s political insights strikingly simpatico with my own. 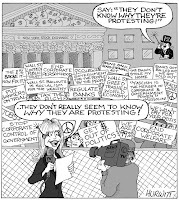 One of his cartoons that has gotten widespread recognition is on the Occupy Wall Street movement and makes points very similar to points I made in this article: Friday, October 14, 2011, Not THAT Michael White: Visiting Occupy Wall Street and How I Know The Economy Is Bad (For the 99%). The best place to find Mark Hurwitt’s very most recent work is his bric arts media page: HERE. 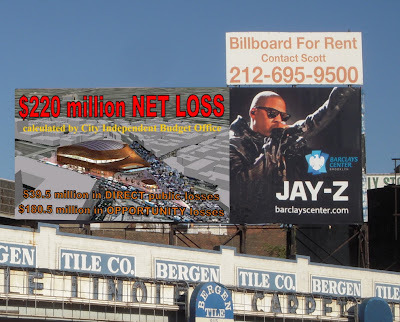 Channel 13, New York’s Premier Public Television Station, Provides Promotion For The Ratner/Prokhorov Barclays Basketball Arena: What To Do About It? All right, I have to admit it. This article is structured as crescendo of rage. So the further you read the more you will find that is absolutely appalling. I am writing about Channel Thirteen's promotional endorsement of the Bruce Ratner/Mikhail Prokhorov basketball arena being built where the brownstone neighborhoods of Park Slope, Fort Greene, Boerum Hill, and Prospect Heights converge. Non-profit Sector as the Future of Serious, Dependable Journalism? Some say the that the future of serious, earnest, in-depth coverage of important public issues will be in public-supported nonprofit sector, especially given the decimation that old-style media organizations have faced at the hands of the internet as those income streams of the days of yore (like the classifieds) have migrated to alternative, now independent venues (like Craig’s list). Newspapers, seem increasingly lightweight, compliant to the influence of press releases and money. Nonprofits like Pro Publica present a plausible alternative. Indeed, much of the best news coverage in this city, including coverage of local issues, comes from New York’s principal public radio stations run by WNYC and during their pledge drives they remind listeners of the increasing importance of the public model. But it isn’t that simple. News reporting is part of media and culture in general and one thing inevitably bleeds into another so therefore everything is connected. And this means that money and monied interests keep asserting themselves even in what is nominally the not-for-profit sector. Channel Thirteen Invites Support of Ratner/Prokhorov Arena? The very beginning of February (February 3rd) I was watching evening TV when an intrusion presented itself on Channel 13, the city’s premier public television station, a station I gratefully thank for presenting programs such as the probing and analytical issue-oriented “Frontline,” “Nova” which frequently covers environmental important subjects as global warming, “The American Experience, which provides overviews of the American past and many more public affairs oriented programs including such things as local coverage of State of the State and City and budget addresses by the governor and mayor. What intruded into my theoretically `commercial free’ public television evening was a promotion for the new publicly-harmful “Barclays” basketball arena being developed by Bruce Ratner and Russian oligarch Mikhail Prokhorov. The intrusion might have been more tolerable if it had been clearly labeled as the commercially funded promotion it was. Instead it came in the form of a veiled product placement inviting Channel 13 viewers to support Channel 13 by venturing to the arena to see an Andrea Bocelli concert. It even made it seem that those Channel 13 viewers going to the arena at the station’s behest would be joining more closely to bond with the Channel Thirteen family. New York public media has exclusive tickets to Andrea Bocelli live in concert on Wednesday, December 5, 2012 at the band new Barclays Center coming to Brooklyn. 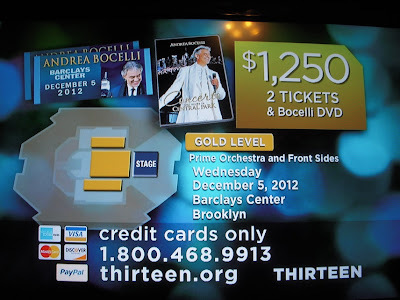 Support 13 on any major credit card and for your $1250 gold level contribution: we’ll thank you with two prime orchestra or front arena side tickets plus the DVD Andrea Bocelli “Concerto, One Night in Central Park. 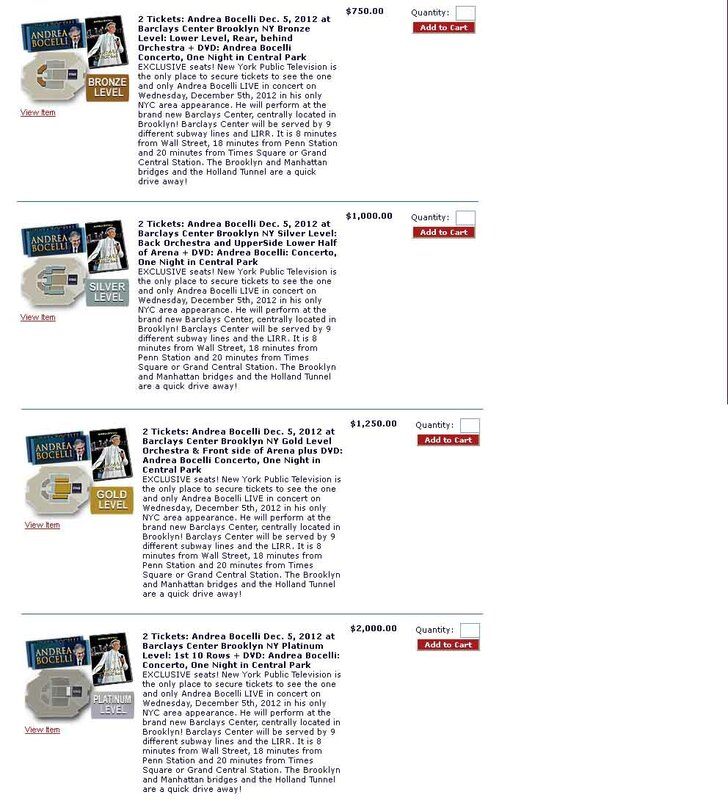 *” Pledge at the $1000 Silver level for two tickets in the back orchestra and lower arena sides plus the DVD. Finally, for your $750 bronze level contribution, receive two lower-level rear tickets and the concerto DVD. This is Andrea Bocelli’s only scheduled appearance in the New York area so don't miss out, join us. `Join' 13 by convening at the arena? “Don’t miss out”? Implying that the experience to be had at the arena would be a pleasurable one? What was the station doing by implying that going to the arena was endorsed by it as something that melded with and was an essential part of the civic good of supporting Channel 13? The PR meisters working for Bruce Ratner and Mikhail Prokhorov had to be slapping themselves on the back about getting Channel 13 to sign onto this one. After all, a major problem they have always faced is that the citizenry that keeps track of public issues and assiduously keeps score concerning who is and is not living up to their civic responsibilities (i.e. essentially a large block of the audience that supports Channel 13), have viewed the arena for what it is, an inexcusable political theft and boondoggle extremely deleterious to the greater community of New York. There are those like me who wonder if any event of any sort could drag me with any happiness to the arena: Knowing its history could I ever be willing to relax and forget myself enough to have a truly good time there irrespective of what event was going on? Join Charlie Rose and guests for stimulating discussions about today's top stories and late-breaking events. That's tonight on Charlie Rose. Admittedly it is to be observed that the influence of money also regularly intrudes into the Charlie Rose show. Every show announces how the program broadcasts from the Bloomberg Building, effectively making New York’s mayor Charlie Rose’s landlord. Bloomberg doesn’t charge Rose rent. And the mayor is not only mayor: While Bloomberg has been mayor his wealth multiplied several fold and he became the wealthiest man in New York City. (Recently he has dropped down to number two). It is safe to say that without his wealth Mr. Bloomberg would not be mayor; further, without his wealth the City Charter would not have been unprecedentedly changed to specially permit Mr. Bloomberg the third term he is now serving. As of 2009 Rose was in debt to Bloomberg for another favor: Bloomberg Television started rebroadcasting his show in primetime around the world and pays him for it. I’ll have more to say about Rose as a “televisual fluffer” when we proceed further, particularly as it pertains to the Barclays Center. Still, it should be acknowledged that Rose is very smart and typically well prepared. His interviews demonstrate that softball is not necessarily antithetical to “stimulating.” Nevertheless, the question must be asked whether whenever, for example, Mayor Bloomberg or someone else to whom Rose might be beholden appears on his show, that softball deference may prevail to a much greater extent. Announcer: What happens when you expect more? You ask more! You discover more! The next line was delivered by another PBS interview talk show host, Tavis Smiley: And you become more! Back to the station announcer: Now celebrating 20 years in broadcasting, Tavis Smiley keeps pushing the envelope. Given that we are talking about PBS promotion of the Ratner/Prokhorov Barclays arena, it is worthwhile to note that it is Tavis Smiley who, when he wants to remark philosophically about authentically adhering to your principles refers to a quote he attributes to friend Jay-Z: “You can SAY what you SAY, but you ARE what you ARE.” Jay-Z is the pop superstar who, having been given a small piece of the action, has, together with his superstar wife Beyoncé, been uncomfortably promoting the damaging Ratner/Prokhorov arena. Frankly, in terms of `expecting more,’ I am expecting more and would like to demand more from Channel Thirteen. Is it serving Channel 13 to be promoting the Ratner/Prokhorov Barclays Center in this way? Doesn’t the channel risk alienating its subscriber base in much the same way that the Brooklyn Museum did when, in 2008, the museum betrayed the Brooklyn community and besmirched the memory of Augustus Graham, one of its principal founders, by awarding its Augustus Graham award to real estate developer/subsidy collector and eminent domain abuser Bruce Ratner, even as he was trying to force through pending approvals of his proposed Atlantic Yards mega-monopoly spearheaded by the arena? The “honoring” of Ratner from whom the museum had received funds and who has unfortunate further influence via Museum Trustee appointments resulted in a well-publicized protest the night of the award ceremony. The museum was asked to apologize for its actions. Certainly, in retrospect events of the intervening years have proved that an apology was owed to a far greater degree than earlier defenders of Ratner might have expected since virtually every negative predication about Ratner and his mega-project have come true, compounded by a slew of additional negatives that were never envisioned. Even so, the museum has never offered the community the apology it requested in 2008. I for one, have never since renewed my museum membership as a result. It is to be acknowledged that Andrea Bocelli has a sweetly beautiful voice. I remember how the sweetness of his voice was used prominently to good counterpointing effect in one of HBO Soprano’s episode when Camilla, the wife of Mob Boss Tony, falls in love with his voice. An arena is also probably a good venue for Bocelli to sing in. He often sings operatic melodies, but since he does not have an opera singer’s voice his singing needs the amplification which he regularly employs. Was I too sensitive when I was startled by Channel 13's promotion of the Ratner/Prokhorov arena in early February? Was I just making it up or imagining things to think that there was a seriously flawed lack of perspective and neutrality in Channel 13's promotion of the arena? Did it really cross the line and endorse the arena as a public good somehow comparable to Channel 13 itself? I don’t think I was being too sensitive. I didn’t know then what I am about to tell you now but this should put to rest all doubt on the subject. To go into that we need to come back to that criticism we cited above: That Rose can sometimes be little more than a “televisual fluffer.” On March 10, 2012 Charlie Rose broadcast what was in effect a half hour high production value infomercial for Bruce Ratner, his arena and his proposed Atlantic Yards for which Channel Thirteen is even now running continuing follow-ups. The fundraising produces a web of peculiar interconnections between Rose and the people he covers. When Muhtar Kent, the CEO of Coca-Cola, went on the show in June, Rose disclosed Coke's underwriting tie of "many years" at the outset. He has done similarly with other guests, showing laudable transparency. And yet the "fullness" of the disclosure can be in the mind of the discloser. Should Rose, for instance, have disclosed that in 2002 he had served as emcee at the Coke shareholders meeting, at which he declared, "It is a privilege to be associated with the Coca-Cola family"? Rose says this is "nitpicking to a fault." "I wouldn't take their money if I didn't want to be associated with them,*" he says. Notwithstanding, the Bloomberg and Coca-Cola support that flows in, Kaplan suggests that Rose is not driven by money and is, in fact, a rather poor business man distracted by the love of the art of what he does. There is no question that Rose has conducted some remarkable interviews but Mr. Oder’s suggestion that Rose’s fawning interview of Bruce Ratner was a nadir is exactly on target. All of this facilitation can involve going way overboard as Rose did with Ratner. In what was a virtual parody of a late night infomercial Rose asked Ratner questions and provided fill-ins that were nothing but cue cards for every talking point Ratner probably arrived intending to make. In fact, you can read Rose’s questions to Ratner without reading Ratner's responses to know approximately what Ratner came prepared to say and ultimately did say during the interview. Here is a Noticing New York breakdown and analysis in that regard if you would like to know more about the interview: Monday, April 2, 2012, Charlie Rose Does Infomercial For Forest City Ratner. Throughout the Ratner interview Rose assisted Ratner to present PR slides, many of them just the typically suspect strategically-illuminated architectural rendering with sonorous announcer-voice glitz and unjustified exclamations of praise. In a recent, interview of French actress Audrey Tautou that ran just over 18 minutes, one minute and 40 seconds was taken up by showing the theatrical trailer for her new film, another minute and 5 seconds was taken up with a clip selected from that film, and all of this was supplemented by a two minute, thirty second montage of Tautou's past performance highlights. In all that's five and a quarter minutes from Tautou's press kit out of an 18 minute interview. Maybe it’s appropriate to treat an actress this way and to see her film, even selected highlights, is actually to see her work. Is it appropriate to treat real estate developer Bruce Ratner the same way? Between unpacking Ratner's press clips and helping Ratner get out all his talking points there was nothing more to the interview. Thirteen offers our supporters exclusive seats to Bocelli’s December concert at the Barclays Center, his only New York appearance. The American people have named PBS . . .
. . the most trusted source of news . .
. . . and public affairs . .
. . . and the most unbiased institution in America . .
. . . for the ninth year in a row.
. . . the American People have spoken. . . It is Charlie Rose who, amongst the other personages, delivers the line “and the most unbiased institution in America” and it is Tavis Smiley who gets to deliver with quiet emphasis the single stand-alone word “Trust” (Momentarily appearing on screen before he utters it). Of course, the 2012 Harris Interactive “Trust Tracker” study being referred to said that PBS, not Thirteen, was the trusted entity and the tagging on of (Channel Thirteen President Neal Shapiro’s) “Thanks for trusting Thirteen” was probably done locally just as it probably was done at other local PBS stations. Similarly, it is also only fair to point out that while PBS runs the Charlie Rose show it is only local PBS station Channel Thirteen that is intertangling its showing of this spot, the Charile Rose Ratner interview and the station’s promotion of the Ratner/Prokhorov Barclays arena. The thanks-for-trusting-Thirteen spot was followed by another chance to make a contribution and then a Thirteen-March-Support-Great-Programs mix-up of spliced program clips in which appeared, again, Andrea Bocelli. If you were in the audience of Andrea Bocelli’s sold-out Central Park concert in 2011 you know it was a night that neither you nor he will ever forget. Bocelli returns December 5, 2012 to the new Barclays center for his annual holiday concert. Thirteen offers you an exclusives early opportunity to enjoy his only New York area appearance, live in Brooklyn, only minutes away by subway or Long Island Railroad. The America people have named PBS the most trusted source of news and public affairs . Then Tavis Smiley: . . . and the most unbiased institution in America for the seventh year in a row. And back to Rose: Trust, the American People have spoken. Channel 13 announcer: At Thirteen you can count on us. Channel 13 president Neal Shapiro: Thank you. This is then followed by a repeat of exactly the same Trust-Thirteen spot that followed the Rose Ratner interview program. One extra niggle of a problem though: One of these spots tells us that the American People have named PBS most trusted institution for the seventh year in a row, the other tells us it’s the ninth year in a row. A Channel Thirteen representative informed me that the Andrea Bocelli arena concert is also being run on Thirteen’s affiliated PBS sister station WLIW21. Since the mid-1990's, the underwriter announcements that precede and follow many public television programs (and usually conclude with the narrator thanking "viewers like you") have gradually adopted many trappings of regular advertising, despite appearing on "commercial-free" television. More recently in May of 2011, the Times reported that PBS was planning another shift, inclusion of promotional messages and branding within PBS shows breaking to into them like commercial television every 15 minutes rather than just at the very beginning and end of programs. (See: Advertising: PBS Plans Promotional Breaks Within Programs, by Elizabeth Jensen, May 30, 2011). PBS shows currently run 50 minutes or more without such interruptions. So far I haven’t observed an implementation of these proposed very frequent interruptions. The progression toward this great resemblance to commercial television has been gradual and over an extended period over time. In 1984 Federal Communications Commission gave permission to PBS to relax its very tight, original 1967 limits on underwriter credits and allowed non-promotional logos and “value-neutral” descriptions of products or services. “Enhanced Underwriting” appeared in 1993 or 1994 but that underwriting was not allowed to have a “call to action,” or to use superlatives or say that the company’s products were better than others. In 2003, PBS introduced 30-second underwriter messages. These messages often include marketing slogans and images from the sponsor’s advertising campaigns. So amidst this accelerating slide toward commercialism why should Channel 13's promotion of the Ratner/Prokhorov Barclays arena command attention? Almost all advertising, even when collapsed into the sliver of a several second announcement strives to strike the key notes of a classic formula: create/identify a need, identify the product being sold as the solution, end with a “call to action” (buy the product) and make sure the audience remembers the product name. These are the elements that public broadcasting underwriting guidelines have sought to rein in, particularly the “call to action.” The boundary being crossed with the arena promotions that makes them distinctly different is not just the presence of a “call to action” (the entreaty to go to the arena) but from whom that call to action is emanating, Thirteen itself rather than a sponsor. Normally underwriting credits are a disclosure of funding (and therefore also disclosure of a possible conflict of interest) wherein the sponsor itself gets a chance to say in its own words something nice about itself, for the most part mainly just patting itself on the back for supporting the show. In the case of the arena promotions Thirteen is running it is the PBS station itself that is endorsing the product and even associating it with the public good. It hearkens back to what we frequently saw in the early days of television, and much more rarely see now, when on programs like the Today show hosting personages like Dave Garroway would themselves shift from the content of the program to present and personally endorse products. It’s not that Channel 13 doesn’t have the free speech right to endorse the arena as a civic benefit for the public, it’s that Channel 13 hasn’t earned that right by engaging in the hard analysis that would allow it to reach such a conclusion. The slovenly Charlie Rose interview of Bruce Ratner certainly doesn’t count in this respect. At the very least, Channel Thirteen needs to start with a recognition of the extreme controversiality of the arena and its associated land grab. It should understand why that is. It will be interesting to see whether “Battle For Brooklyn” will wind up playing on Channel Thirteen’s air given that its narrative so directly contradicts the kind of Ratner hype associated with Thirteen’s promotion of his basketball arena. How Channel Thirteen steps up to cover local issues is all the more important in that we have voids in coverage from different and necessary viewpoints when developer-friendly Rupert Murdoch buys up the local community papers and a paper looking askance at eminent domain abuse like the Sun folds. In March of 2011 Channel Thirteen was unveiling its new its web-based MetroFocus stepping in to cover, “local news, culture and life in the New York City region.” That new media organ has the potential to go a long way in filling that void, successfully providing intelligent insightful coverage of urban design and development issues much akin to what like listener-supported WNYC has accomplished. 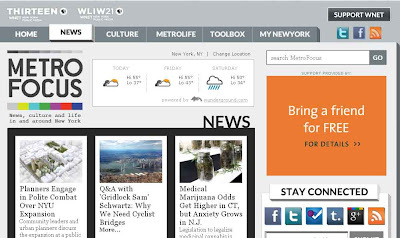 In addition to broadcasting local public radio, WNYC provides excellent web-based journalism accompanying the on-line availability of its broadcasts complete with extensive archives. Thirteen’s Metrofocus has been addressing itself to urban design and development issues and has covered Atlantic Yards and the Barclays arena which, given their criticality, are stories Charlie Rose seems to have skipped over. Notwithstanding MetroFocus, the real money and resources you see from Thirteen are what you see on the broadcast on its Channel 13 and 21 TV stations. Channel Thirteen’s IRS filing 2010 IRS documents say that the station received $22,424,003 in government grants and contributions. That’s almost equal to the $27,400,263 Thirteen lists as having received in membership dues. The membership dues figure are, in turn, only 24.7% of the $110,795,564 listed for its total gifts and grants revenue figure. Further, that $110M+ “gifts and grants” figure doesn’t include all the station’s revenue. And WNET’s IRS filings say that it received another $1,477,792 in government grants and contributions. Channel Thirteen’s public relations department informed me that, “Thirteen’s viewer support constitutes approximately 22.9% of our donations per year.” They also informed me that “about 1 in 12 Thirteen viewers are members.” That’s down from the 1 in 10 figure I remember Thirteen reporting during is pledge drives in the 90s when it was saying that, by comparison, the ratio of viewer support was 1 in 7 for the PBS station in Los Angeles. "Listener Supported" vs. "Public Broadcasting"
It is to be noted that there is a difference between `listener-supported' and `public broadcasting.' It might be said that the HBO subscription pay-TV model is far closer to a `listener-supported' model than is the PBS Thirteen model. And indeed, answering to its listener subscriber base HBO has broadcast some important documentary films like: Josh Fox’s “Gasland” (about hydraulic fracturing and in 2011 was also in the running for an Academy Award), “Hot Coffee,” (about the efforts to limit the ability of the public to get redress from the courts) and “Hacking Democracy” (about how voting computers in use such as Diebolds are easily susceptible to hacking, nominated for an Emmy for outstanding investigative journalism). Relationship With Audiences That Can . . .
Obviously, in the free enterprise system, attention must be paid to the demands of the viewing audience, particularly when, as with HBO, one does not engage in the compromises of generating so-called `free' TV by accepting advertising. But advertising -supported broadcasting needs its audiences too. Rupert Murdoch has owned and controlled many press outlets in his empire: He nevertheless doesn’t conform their content to make their points of view identical or too perceptibly identical to his own. When he bought the Wall Street Journal he knew he would lose its audience if he stopped providing what its readers considered reliable news and made its content like that of the Fox network or his tabloids. (Even if the Journal is looking more tabloid-ish these days- see picture.) It is around the edges together with wherever it is critical where you see the results of Murdoch ownership and control. 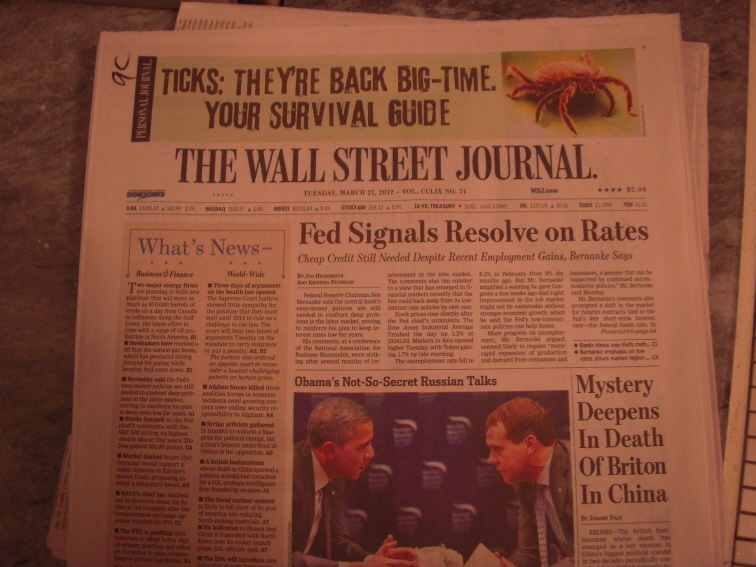 When the Murdoch hacking scandal broke in England the Wall Street Journal was reluctant to cover it just as Fox News was. This has been well covered by, for instance, NPR’s “On the Media” but PBS’s new Frontline, “Murdoch’s Scandal” provided a pithy summary of what happened. The Journal ignored the hugely important story the English paper The Guardian was breaking. The rest of the British press seemed afraid to join in the coverage. Then the New York Times joined in to pay attention to the scandal elevating its importance. 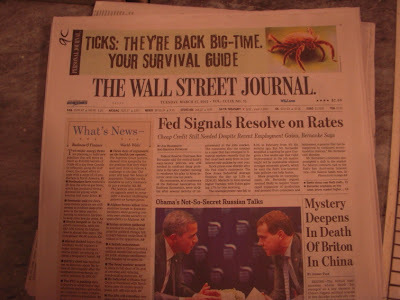 The Wall Street Journal editorially criticized the Times for this. As Times got involved we saw an example of what has been called the “Times Effect” kicking in (there is probably also a PBS effect), the floodgates opened and it seemed every paper everywhere was jumping on the scandal except that the Wall Street Journal was still reluctant to report on it no matter its importance for American business. Years, ago TechTV, a 24-hour niche channel based in San Francisco, was a beautifully nerdy network about computers and technology featuring instructions on hugely outsized computer screens and discussion of all sort of intricate computer programming arcana. In New York Tech TV went to its viewers seeking their help it keep its place on the cable dial which the viewers did but shortly after that fight was won the station abandoned its programing and became the G4 network, dopily pitching hype about boy toys to a very different young, low-brow, audience. It would be a shame if in time there was a similar squandering of the entrusted legacy of Channel Thirteen and the rest of the PBS system by turning it into a conduit for the PR messages of the corporate interests and local real estate moguls, especially given the significant public investment it took to create the public system and the fact that once seized and so looted it could probably not be recreated. Direction Comes From . . . ? It would be easier to blame the Thirteen board of Trustees. Certainly, if nothing else, any Trustees who are viewing what is on the station have not, by complaining about it put a halt to the arena promotions. But would the Trustees think anything of it, the way viewers like me are automatically appalled? Looking at the WNET board of Trustees you will see some very wealthy and recognizable names and, as might be expected, there is overlap and interrelationship with the list of the station’s very largest donors. Remember that most of the money is not coming from listeners since listening membership contributes only 22.9%. Notably, a man with a name very recognizable in real estate circles has been appointed as chairman: James S. Tisch. Tisch (is President and Chief Executive Officer of Loews Corporation and is involved in construction through the hotel chain. Tisch is also on the board of the New York Federal Reserve with Kathy Wylde and Lee Bolinger, both of whom advocate abuse of eminent domain. According to the station’s IRS filings Mr. Tisch puts in an average of 4 hours a week for the station without compensation. There are other names on the super donor and Trustees lists that are recognizably connected with real estate. By no means are all of the names so connected. That’s not the point. The point is: Of this list many of those who are not directly connected with the business of our local real estate barons are still in the class that is likely to be regularly hobnobbing with them. Even if it is true that Channel Thirteen aspires, as it says, “to serve the underserved” it might not be easy to pick out a preponderance of its board members who would be the best candidates to instinctually represent the interests of the “undersreved” over those of the real estate moguls like Ratner whom they are regularly encountering on the charity grand event circuit. For instance, Board Vice Chairman Ann G. Tenenbaum, a big donor in her own right, seems to do a fair amount of hanging out with various Tisches (Jamie, Alice, Jim) based in the number of event photos that Google at the top of the list. Ditto for Vice Chairman Dirk Ziff. This transaction did not involve anyone from our Board of Trustees. I was also informed that: “The total number of tickets we will be receiving has not been set yet; we will receive NO Sky Box seats.” So the relationship has an interesting informality to it despite the investment in the commercial spots being broadcast. Rather than the board being involved I was informed that the decisions approving the December 5, 2012 concert promotion, and the approvals of the announcement and spots about the promotion that are being aired, when they will be aired and how they will be ordered and interleaved with other announcements has been the responsibility of Channel Thirteen President and CEO, Neal Shapiro*, executive producer David Horn of Great Performances (one Ratner connection popped up), and Thirteen programmer Kent Steele. the visuals of the Barclays arena (inserted into the promotions that Channel Thirteen has been running) were supplied directly by Sugar Music or came instead either from the one of the Forest City Ratner companies or from one of the public relations companies that have been working for the Forest City Ratner companies, I was told they came from a website. I am asking about which one and still awaiting word. The PR department says that “Thirteen has had a long and mutually respectful relationship with Bocelli.” As already footnoted Thirteen broadcast Bocelli’s Central Park Concert in 2011. Channel Thirteen has long been a place where you could find chronicled many important public issue battles, many that were, or are, in danger of being lost. The human race may, for instance, be losing the race to counteract global climate change but despite the fact that David H. Koch’s money is prominently announced as funding every episode of PBS's Nova (and David H. Koch is on the Thirteen board as well), Nova and other PBS programs like Frontline keep bringing the issue of global climate change to the fore. Even when so many defeats are faced, the public broadcasting system has, at least, always provided a forum where we can collectively shake our heads in pity with an informed consciousness about what should be done or what should have been done. It will be a real tragedy if in the future PBS and Thirteen transition and we find that not only are these just and necessary fights lost but that an appreciation for their importance is then buried under false and uninformed the-victor-writes-the-history PR hype. Loss of control over Thirteen is something we should all be on guard to prevent. I could offer an admonishment that in order to have more control we should all be listener supporters in order to have greater influence over the station. Or, looked at another way, is that a doomed strategy in a world where wealth has been increasingly redistributed from the 99% to the 1% in schemes like Ratner’s arena-associated mega-monopoly land grab? 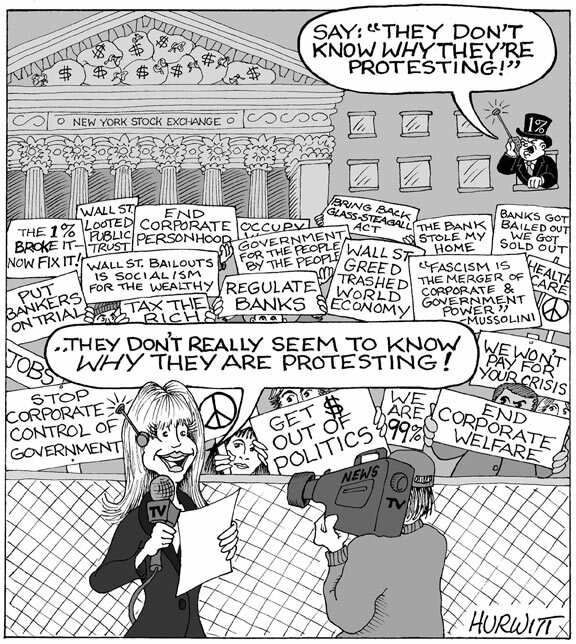 How can the 99% expect to keep up and compete? I don’t think anybody is about to put me on the Channel Thirteen board. Maybe the better strategy is instead to do exactly the opposite: To terminate membership support for Thirteen just the way I decided I had to terminate my membership support for the Brooklyn Museum after they falsely put Laurels on Mr. Ratner’s head at great sacrifice to the community they had a duty to serve? Channel Thirteen is telling us as their audience that we should “Trust Thirteen.” At this juncture don’t we need to turn the tables and tell Thirteen that an essential element of trust has been lost? That the station is, indeed, breaching our trust in a deep and untenable way? Channel 13 Board of Trustees meetings are open to the public. 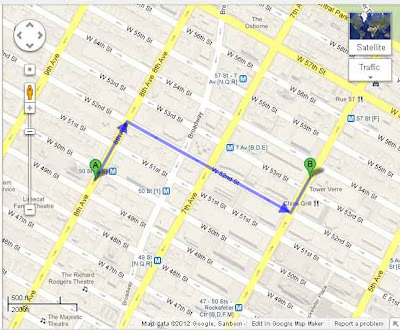 The next board meeting is Thursday, May 10, 2012 3:00 p.m. (WNET, Worldwide Plaza, 825 8th Avenue 14th floor, Kellen Board Room). Interestingly, May 10th is the same day that Bruce Ratner will, starting at 11:30 AM, just six blocks away, be the Guest of Honor at the New York Building Congress's 91st Anniversary Leadership Awards Luncheon at 1335 Avenue of the Americas. The strategy is to keep those accolades coming for Mr. Ratner as he steals from the public and thereby hopes that no one will notice. Tables to sit inside with Mr. Ratner start at $25,000. The luncheon underwriters are listed as Bruce Ratner’s own Forest City Ratner company, Rudin Management Company and (billing itself as one of the worlds most ethical companies) AECOM. Now why ever might it be worth mentioning the coincidence of these two events? What happens when you expect more? You ask more! On March 10, 2012 Charlie Rose broadcast what was in effect a half hour, high production value infomercial for Bruce Ratner, his arena and his proposed Atlantic Yards. In an earlier piece about the Charlie Rose interview written before Mr. Oder had an opportunity to actually see the interview (he had only been able to read the very promptly-appearing quotes from the NetsDaily) Mr. Oder noted how conflicts of interest can affect Mr. Rose's show and pointed out that funders of Mr. Rose's show have interests in play in connection with the Ratner/Prokhorov "Barclays" basketball arena. Coca-Cola is likely Rose's biggest underwriter and Mr. Oder noted that “Coca-Cola has a deal with the Barclays Center. If Coca-Cola isn't the biggest funder of his show it is probably because Bloomberg, the business arm of Mayor Michael Bloomberg, is outpacing it by providing both free rent and, more recently, syndication for which it also pays Rose. Rose's interview of Ratner was so much like a late night infomercial that you can read Rose’s questions to, and other exchanges with, Ratner without reading Ratner's responses to know approximately what Ratner came prepared to say and ultimately did say during the interview. I am providing them further below in this article so you can put this assertion to the test. Rose's exchanges are like cue cards to keep Mr. Ratner on track with a predetermined message. Rose's side of the conversation consisted of three categories of things: 1.) friendly and leading questions, 2.) helpful restatements of what he suspected Ratner hadn't said well enough, 3.) oddly enthusiastic exclamations of praise. The eager breathlessness with which Ratner tumbled out his responses added to the feel of this being an infomercial. Prokhorov . . . That Card! Much of Rose's side of the exchange seems to come from index cards that Rose can clearly be seen handling at many keep points in the interview, cards prompting Rose to prompt Ratner. 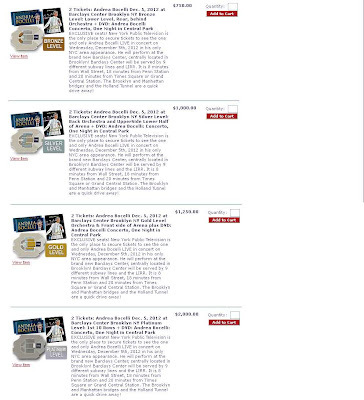 Three of the times cards are quite apparent in connection with questions are when Rose asks Ratner about Jay-Z, when Rose brings up Ratner's formation of a partnership with Russian oligarch Mikhail Prokhorov, and when Rose mentions that the luxury apartments being rented in the Ratner's 8 Spruce Street City Hall area building benefit from 360 degree views. (That's because Ratner was permitted to build it so much taller than the surrounding buildings and the government helped him by putting a school in its base.) Ratner inaccurately describes the building as being in Tribeca. Rose's cavalier, jokey exchange with Ratner about Prokhorov may some day come back to haunt him. Ratner joked that Prokhorov almost became president of Russia. Prokhorov has long been one of the insiders who get along with Putin. Most interpret his feint at a run for president as an effort to be deflect real opposition to Putin, but Rose wasn't doing a serious international affairs interview so he simply played along. Even though he was working from cards, Rose made several mistakes. There was the simple, slip of the tongue mistake of referring to Atlantic Yards as "Atlantic City Yards." Ratner joined the family real estate business but Rose mistakenly, and awkwardly, assumed that Ratner's father had started the business. Another interesting slip was when Rose seemed to assume more than he knew about the involvement of Amanda Burden, the City Planning Commissioner and Planning Commission Chair with Ratner's Atlantic Yards. Rose has had an on-and-off relationship with Ms. Burden for nearly two decades and is a godparent to two of Ms. Burden's grandchildren. Rose assumed for a moment during the conversation that the planning commission (and by implication Ms. Burden) had been involved in putting affordable housing in the Atlantic Yards project. Not so. The affordable housing is really just a function of Ratner's use of the tax code for subsidies (and therefore being subject to meeting its requirements) and similarly expecting to participate in state and city subsidy programs. Ms. Burden did get involved with Atlantic Yards but her participation was to engage in a bit of kabuki theater to get its exceptional density over the hurdles of public objection. This then may provide a window on their pillow talk. • Tell me how you see developers and what do you think of the role of developers; what should we admire them and why should we not so much admire them? • What is it about Brooklyn for you? • But you grew up in Cleveland? • And the headquarters of your company is still in Cleveland. - Your father was the largest developer in Cleveland. Did he start the business? • There was a real opportunity there to it [Brooklyn]. I mean it has a certain romance about it. It’s close to . . . across the river from Manhattan one of the great cultural centers of the world. Yet it has its own essence as well. • And what you want to do is rebuild that essence of Brooklyn. • Here’s what’s interesting. You formerly were in government. You have a very good relationship with the president of Brooklyn, the Borough of Brooklyn. And the two of you seem to be in lockstep about wanting to change Brooklyn. He sees you as an ally and you see him as an ally. • So what’s about Atlantic City Yards? What’s that about? • A place that basketball people will love! (The arena.) Ratner responds, expanding the list to mention among other things that the arena will be loved by people who love circuses and people who love concerts (watch carefully for my upcoming, soon to published post about a "concert"). • You did that out of some instinct for there ought to be public housing rather than what can I do that will give them an opportunity to give the go-ahead to my project? • [Simulated image of the interior of the arena] Look at that place: tell me about it. • Will you have a lot of those boxes [luxury suites] that people like to have? • You hired Frank Gehry as your architect. You love Frank Gehry. More about that in a moment. So what happened there? Frank was come out there. . He was going to design your place. . . And Frank is no longer there, he's no longer designing this: Frank Gehry, the most admired, best known architect in America. You had him! What happened? • OK, so what are we left with at Atlantic Yards? • SHoP architects? (Mispronouncing the firm’s name) Oh, they’re good. They’re good! They’re good they have a good reputation. • Did you like the Olympic building that was done in China for the Beijing Olympics? • Because there is a sense of motion. • I should mention that during this you went into partnership with a Russian billionaire. . . You’re smiling because he’s a good partner? • He has a genuine love affair for basketball and the Nets? • The other celebrity member of this whole organization is Jay-Z. He’s a partner, or he’s what? • How did that happen [flying out to see Prokhorov in Russia]. Did you know he was interested? Somebody was a broker somehow to put you two together? • Showing a slide of the New York Times building: "This is by the great Renzo Piano, who’s a wonderful man and a wonderful architect who’s done a lot of extraordinary buildings in different places." • So tell me about this building: What’s it about? What did the New York Times hope to accomplish and how did Renzo Piano give expression to what the headquarters of the August New York Times ought to look like? • Was Frank Gehry among the finalists in the competition [to design the new York Times building]? • And what happened to your beloved Frank Gehry on this one? • You know the reasons . . . as he expressed them? It wasn’t you though. • The Times is happy? • Looking at a slide of 8 Spruce Street: "This is a building that architecture critics including the New York Times have just raved about, have they not?" • And how does that make you feel? • This has an interesting kind of configuration: There is a public school on the first floor. • What are the rents? 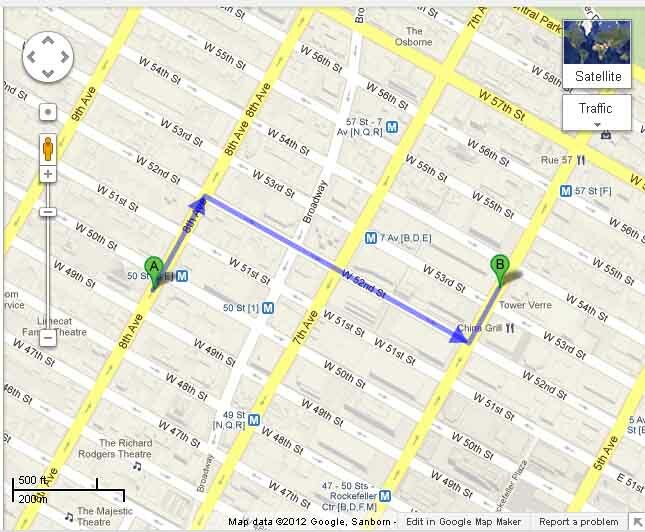 • A huge 360 degree view of everything in Manhattan, Brooklyn, New Jersey, Empire State Building and everything else. • Let’s talk a minute about . .because you were interested in this sort of modular building. What does that mean and is that a wave of the future? • Less expensive or not? • Finally, where are we in terms of this? : Everyone understands that the key to economic recovery is housing. It’s been the lagging indicator, because of too much supply of housing, too many people had housing, too many people couldn’t afford housing, the supply got way out of context with the demand. Where are we now? • Everyone wants to build in New York, the great architects and the great developers all want to build in New York Right? Is there much building going on here because we just read what happened down in the World Trade Center, they’re going to cap off a couple of the towers down there at like seven floors, not sixty. • So tell me about your dream. There are a few things you could learn from the interview but only if you were very in the know and quite attentive to details. In David Mamet's plays about con artists he talks about a "tell," the physical giveaway you can pick up on that let's you know when somebody is bluffing. When the subject of modular construction* comes up in the interview Ratner admits that its never been done with a building of the height he is proposing and you can hear a peculiar little catch in his throat making him sound quite uncomfortable that, to my mind, is a "tell." Ratner was very clear in the interview that if and when any other buildings are built on the arena block there will be no more than three such buildings, not the four originally proposed* but he still intends to have sixteen additional buildings on the twenty-two acres that would nominally be the Atlantic Yards sites. (Ratner actually plans that there will be a total of nineteen towers plus two shopping malls on the 30 contiguous acres in this part of his mega-monopoly, something he doesn't talk about and that Rose didn't wind up finding out.) That means one building will move over, cocking the rest of what was his original site plan out of whack. That, in turn, means that the only currently existing proposed site plan for the rest of the site is the community's UNITY Plan. One thing I realized about the arena as Ratner was slicing his hands through the air to demonstrate the sharp angles involved: What Ratner's Forest City Ratner has been selling as a negative may very well be a negative they are trying to disguise. The company keeps saying that the arena will have exceptionally good sight-lines. It turns out that what this means is that the viewing stands will be exceptionally steep, steeper (Ratner was saying) than any other arena in the country. Desirable? It is likely not being done because it is desirable but as a consequence of trying to cram the arena into a very tiny footprint given the way it is hemmed in by surrounding streets. Viewers are likely to find themselves tucking their chins down on their chests to see down the steep angle. There are psychologists who will tell you that this is frequently counterproductive to getting people into good moods: It sort of goes along with the expression or concept of being "downcast" about something. Ratneresque Horticulture: How Doesn't My Economic Garden Grow? There is an old play on words: "You can lead a whore to culture but you can't make her think." Close to the end of the interview Rose went off base and Ratner really wound up over his head when Rose asked him to explain how the creation of housing interrelates with the national economy. I suppose the idea was that if Ratner, working with government, is getting so much subsidy from the government (he is a master subsidy recipient) he should be able to explain why all this is good for the economy. But Ratner isn't a big player in the bigger national housing economy Rose was asking him to talk about and right now part of the problem explaining why the economy has been so generally listless is that there is too much housing, or more housing than people can afford in a bad economy. The solution therefore isn't to subsidize Ratner to produce more of it. If Ratner really wanted to do some explaining about the economy he ought to own up and admit that the current economy is weak partly because of the kind of crony capitalism he promotes drains it so much . . .
. . . With all due respect for any women who I might seem to have impugned just above by virtue of compensation they might get for their companionship, Ratner's (Harry Brock-like) willful dunderheadness about the harm that his buying of politicians causes the rest of us could provide a marvelous opportunity for a "Born Yesterday"-style civics lesson teaching moment. That’s what you want to believe, that somehow the developer has some instinct beyond money that respects, that respects history, that respects location, and that respects the future in the sense that people will say that’s more than a building, that’s something that lives and breathes as a sense of where civilization was and where it might be going. When Ratner was asked about Metrotech in the interview he explained that it had been designated as an urban renewal area (unlike his Atlantic Yards site) and commented derisively that back in the 1980s it was "nothing but parking lots and empty buildings." That's not exactly true but the derisive dismissal of the value of parking lots is interesting given that parking lots are what he is creating with his Atlantic Yards site. A great deal of Rose's interview involves unpacking Ratner's press kit of images, many of them the typically suspect architectural renderings of things that do not yet exist. Here is the very similar but corrected image Noticing New York previously ran. 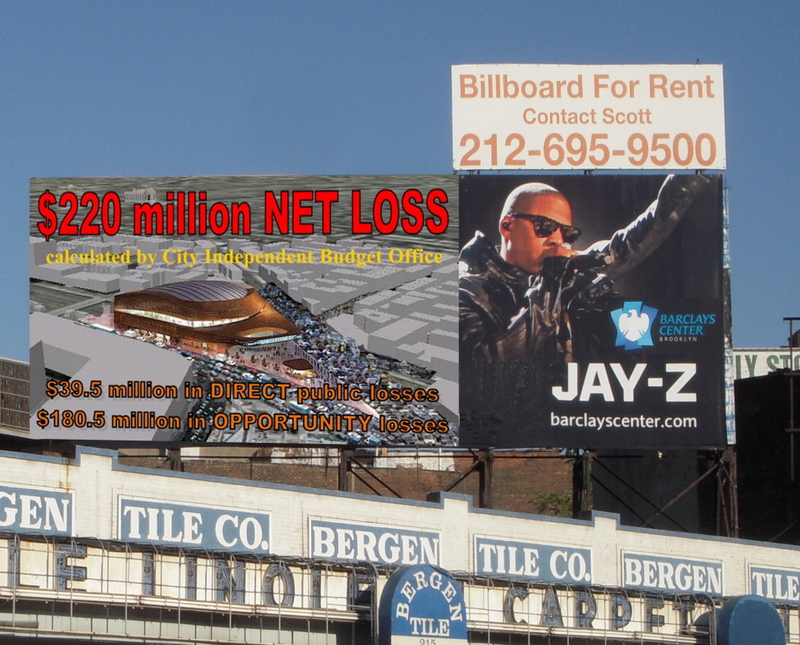 I will have to go back to see whether the actual billboard has been changed, updated since I last photographed it to remove Jay-Z's image and substitute the basketball players. Here is a link to my earlier post with corrective images: Wednesday, October 26, 2011, Longing For Correcting Images to Jay-Z’s Hip-Hop Hype and Ratner’s Atlantic Yards “Strategy of Distraction”. Between unpacking Ratner's images and helping Ratner get out all his talking points there was nothing more to the interview. A Rose Role Is A Rose Not . . . . In one respect I may have been unfair describing Rose's Ratner interview as a grotesque parody of a late night infomercial. State of the art infomercials these days use two interviewers, one is the facilitator, the other is the interviewer who starts out sounding skeptical and then- low and behold!- is won over by the end of the half hour. Rose, playing just one role, left out the skeptical part entirely.